Mix together yeast, flour, sugar and salt. Whisk together the egg and milk, then add to the dry ingredients. Stir in enough warm water to form a soft dough. Knead until smooth, then cover and leave to rise until doubled. Roll dough out to 5mm thickness, then cut out small rounds. Cover then leave to rise again for 30 minutes. Heat oil to 175C then fry the doughnuts until golden brown on one side, then flip over to brown the other side. Stir together hot water and Jacobs Coffee until dissolved, then stir in icing sugar, glucose syrup and vanilla until smooth. 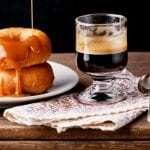 Dip doughnuts into glaze to cover the tops, and then place on a rack, sprinkle with ground Jacobs’s coffee then leave to set for 20 minutes or until glaze is set.